Seafood dishes of all kinds are notoriously difficult to prepare and serve correctly, especially at large-scale events with hundreds of guests. Only the best onsite prep and cooking practices, alongside impeccable timing, can result in a delicious seafood spread for you and your guests. Therefore, it is wise to leave the delicacies of seafood catering to the professionals when it comes time to plan your next catering event. Utilize this guide to learn about the delicacies of seafood catering – and reasons why you should hire a caterer to help. Skilled and experienced caterers can handle the intricacies of prepping and cooking seafood ingredients of all kinds. Popular seafood dishes handled by professional caterers include clambakes, lobster bakes, fried clams and steamed mussels. Poached salmon, seafood kabobs, and classic New England fare like boiled lobster and lobster rolls are all also on the table when your catering is handled by experts in the industry. Your caterer can help you create the perfect menu, featuring all your favorite seafood appetizers and main courses, for your event. If you cannot whittle down the choices, professional caterers often allow you to add a la carte items to your menu. You may also mix and match menu packages to create the amazing seafood spread you imagined you would serve your guests. For the best dining experience for you and your guests, all types of seafood must undergo the correct prep and cooking procedures for the perfect length of time. Once the seafood is ready, your caterers must rush to plate and serve to provide the highest quality meal to every guest at the event. If anything goes awry in the prep and cooking processes, the seafood dishes could taste bad or even end up completely inedible. For example, if not served immediately, the breading on fried clams could become soft instead of deliciously fresh and crispy. If boiled even slightly too long, fresh lobster can become chewy and tough instead of tender. The risk of foodborne illnesses is also quite high for improperly prepared and cooked seafood. Thankfully, you can ditch the worry and leave these important details to your caterer to enjoy a delicious seafood meal alongside your guests. When you acquire professional seafood catering services, you can rest assured that the food will arrive on the table piping hot and well prepared. You can leave the details to the experts and enjoy your event, and the meal, without worry about getting the seafood just right. Seafood catering companies go above and beyond simply preparing and serving the main seafood dishes. These professionals prepare exceptional side dishes and delicious desserts that perfectly complement the seafood to round out the meal. Your catering professionals can easily scale the event to accommodate any number of people from under 40 to more than 400. As your guest list grows, your per person pricing decreases to reflect the discount given for large-scale events by reputable catering companies. Professionals who specialize in seafood catering come prepared with the tools and supplies needed to serve your selected menu without a hitch. You only need to collaborate with your catering team prior to your event to finalize your menu and confirm your event details. Your catering team will handle the rest by arriving onsite early enough to set up and get started with the prep and cooking procedures. When you have your heart set on serving seafood at your next event, you cannot go wrong when you hire a professional catering team. 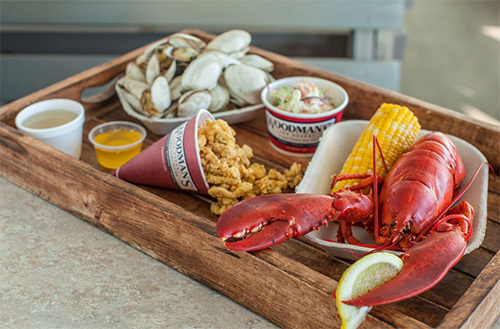 For quality seafood catering services for your next big event, contact Woodman’s of Essex by calling 800-649-1773.